Amur tigers are the largest of all cats. Their thick fur helps to keep them warm in the cold, snowy forests and mountains of Russia. Their black stripes blend in with the dappled light of the forest, making them invisible from enemies and prey. Unlike most cats, they are excellent swimmers and avid bathers. 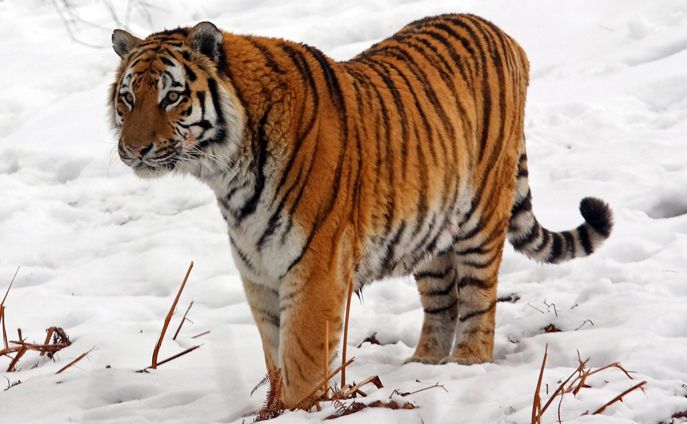 Amur tigers are typically solitary animals. They establish a territory by scent marking and scratching the ground or trees with their claws. The territory of a male often overlaps that of several females. Males and females stay together for only a few days for breeding and then separate. Fifteen weeks later, the cubs are born. The mother raises her cubs alone. They stay with her for three to four years before striking out on their own. Females give birth every three to four years.